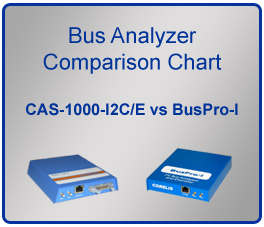 Corelis offers the BusPro-I™ and CAS-1000-I2C™ bus analyzer products to satisfy different technical needs and price points. Corelis bus analyzers and exercisers offer analysis, test, and debug capabilities for product development, system integration, and manufacturing of digital boards and systems. 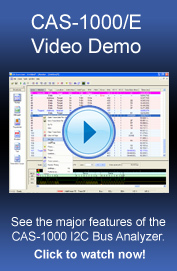 All of our bus analyzers are PC-based and come with a Windows-based software package. Both the BusPro-I and the CAS-1000-I2C/E are equipped with I2C Exerciser, a highly intuitive software package that lets you get the most from your I2C bus analyzer. Each is packaged in an attractive, integrated enclosure, for optimal bench-top and test floor convenience. The BusPro-I™ is an affordably priced powerful instrument designed to meet the needs of engineers tasked with debugging and troubleshooting board-level I2C bus circuitry. The BusPro-I can be used to monitor and log I2C bus traffic in real-time, generate I2C transactions to communicate with peripheral components on the bus, and perform in-system programming of I2C EEPROMs. The BusPro-I is targeted towards board level testing and debugging. The CAS-1000-I2C/E™ has all the power, flexibility, and features you need to debug, test, and validate the I2C bus circuitry on your board. It provides all the functionality of the BusPro-I analyzer and also provides many additional advanced features geared towards IC verification and parametric testing. The CAS-1000-I2C/E can be used to monitor and log I2C bus traffic in real-time, generate I2C transactions to communicate with peripheral components on the bus, perform in-system programming of I2C EEPROMs, perform master and slave device emulation via scripting, validate bus specification compliance, perform electrical and timing parameter measurement, perform glitch injection, perform clock stretching, and perform adjustable timing skew. The CAS-1000-I2C/E is an enhanced model targeted towards IC verification and parametric testing in addition to powerful monitoring and debug functionality.